Tinyard Enterprise Co.,Limited is one of the top level China film blowing interlink printing machine manufacturers and suppliers, welcome to wholesale film blowing interlink printing machine from our factory. SJ-P series Film Blowing interlinking Printing Machine Set is an economical model designed and manufactured on the basis of advanced similar products at home and abroad,which conforms to the suggestions of customers..
the winding and unwinding film tension is controlled through the magnetic clutch,the brake and the torque motor.This machine can heat and dry at cons-tent temperature through far infrared radiation and is fitted with the temperature displays and length printing counting etc. As a two in one machine,it don't need rewinder at blower and unwinder at printer comparing with two separate machines.So it reduce the costs of whole machine and suitable for small and medium factories. This machine needs less working space and operators comparing with two separate machines. 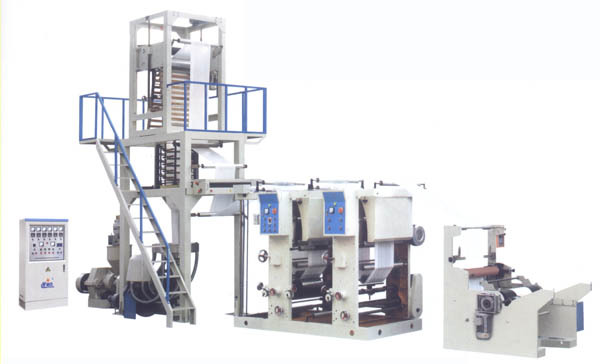 With film blowing and printing finished in one line, its capacity is higher than two separate machines.